C clamp, also called G clamp, is the most common clamp used for woodworking. Most clamps have a sliding crosspin handle or a wing nut for tightening the clamp. Certain heavy-duty clamps have screws that end in a square head and the tightening is done with a wrench. The swivel pad at the end of the screw allows the clamp to position itself on non-parallel work and prevents work from being marred. Certain C-clamps designed for heavy-duty applications are designed without swivel pads. The C-clamps, like any fine tool, can be damaged by rough handling, improper job selection, and overloading. Keep C-clamps in racks when not in use to protect them from damage. Use clamps of the proper capacity. You wouldn't drive a railroad spike with a tack hammer – and neither should you use a light duty clamp for a heavy-duty application or a large, heavy-duty clamp where a small light-duty clamp would do the job. C-clamps generally consists of four parts: the frame, the screw, the handle and the swivel pad. 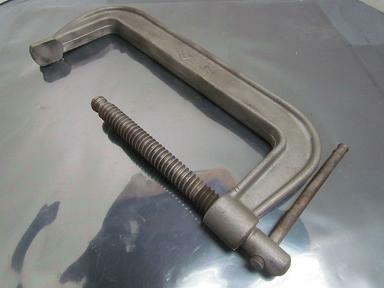 The frame is the main component of C Clamp. It is usually made from stampings, castings and drop forged steel. Here CFS Forge takes the role of producing the frame by drop forging. Generally forged steel c clamps provides the most strength. Any dimensions can be customized in our company by forging. Stronger C Clamps: Forging provides better mechanical properties, ductility and fatigue and impact resistance because this process refines and directs the grain flow according to the shape of C clamp. Significant Savings: Forging reduces the weight required to manufacture the C Clamp frame, therefore, there is a real and significant cost savings. Also, the pieces have less excess so they require less machining hours and less material to be used to clean the piece at the end. Wide range of shapes and sizes: The design of shapes is so versatile that they can be forged from simple bars and rings to more complex pieces, according to different needs. With five forging units, Fly Forge can handle sample to volume runs of forgings for C Clamps in different weights and dimensions. Materials forged could be any specification you need. We offer both closed die forging as well as upset forging processes. So if you have any forging needs for other products, just feel free to send us the drawings. In-house tooling means rapid delivery of your part, from trial sample order to mass production. Secondary operations, including drilling, face milling, threading, coining, cold trimming and more are also available at CFS Forge, making us a one-stop source for all your forging needs. Price is the main advantages for our customers to source forgings for c clamps. As the top China forging company, we enjoy the advantages of low labour cost and material cost, so under the basis of same quality, our price will be much more lower than other forging companies in USA, UK, ect. So if you are sourcing a good forging company for your C clamp project or other forgings, such as clamp straps, pls contact us right away, we will be pleased to offer you our most competitive price for reference first.